A new method, based on the integration of Nickel resistive sensor, was developed to measure operating temperature in GaN HEMTs dedicated to RF applications [1-2] . A specific technological process was developed to place a 200nm wide sensor in a short gate-to-drain spacing. 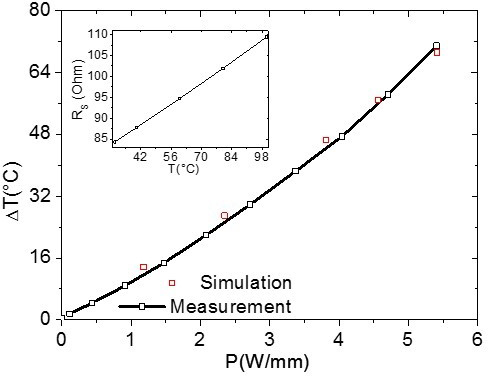 Following a calibration step to measure sensor resistance versus temperature, HEMT is turn on and the sensor resistance is measured in the same time permitting the extraction of the operating temperature of the device (Fig.4a). A nonlinear dependence is observed linked with the decrease of the thermal conductivity with temperature rising. A maximum temperature of 101°C was extracted for a dissipated power of 5.4W.mm-1. This result was confirmed using a 2D physical-thermal model (Fig.4b). 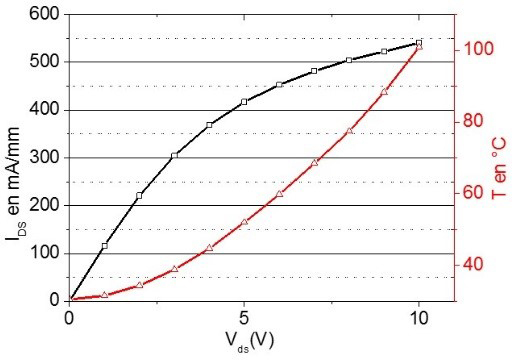 Fig.4b: Ungated AlGaN/GaN HEMT heating measured and simulated vs dissipated power. Inset: Sensor resistance versus temperature. COZETTE F. et al, IEEE Electron Device Letters, vol.39, n°10, pp.1560-1563, October 2018. COZETTE F. et al, 48th European Solid-State Device Research Conference, Dresden, Germany, September 2018.